Indore, the city which is named after its Indreshwar Temple, where Lord Indra is the presiding deity, has a lot more reasons to be amazed about. Be it the ultra-cleanliness, the variety of scrumptious food that it offers, the beautiful bangles, super cool colloquial words like ‘oo bhiyao’ , ‘hao’, ‘tez chl riya hai’, ‘bareek’, only city in India to have both IIT and IIM or beautiful Indori ladies, Indore definitely is a place to be proud about. But what is more fascinating about this place is the girl-power in Indore. They have not only made the city proud but also have inspired the world! Indori women are an absolute beauty with brains. They are all-rounders, smart, independent and have shown to the world that nothing is beyond their ken. Don't tell me that you don't know them. Well, if you really aren't sure about the leading females from Indore, I am sure, once you read their names, you will doubt your general knowledge! The Queen of Melody, Voice of the Nation, Voice of the Millennium, Nightingale of India, none other than Lata Tai, was born in Indore in the year 1929. The recipient of several awards as prestigious as Bharat Ratna, Dadashaheb Phalke Award and many more, Lata Mangeshkar has placed Indore in the world map. She has lived sixteen years of her life in Indore and has her roots in the city. Her works connect well with the residents and the residents never cease to convey their love for the singing legend. Remember the beautiful voice in the song “ Tu hi yeh mujhko bata de…” from the movie Aashiqui and the other songs like “ Kaun Tujhe Yun Pyaar karega….” from the movie M.S Dhoni? That soulful singer is none other than Palak Mucchal. She was born in Indore and has completed her education from the same city. People from Indore are extremely proud of her as at a very young age, this lady has conquered the world with her melodious singing performances. Apart from being a sensational singer, she is a generous human being too. “Palak and her younger brother Palash Muchhal perform stage shows across India and abroad to raise funds for the poor children who need financial assistance for the medical treatment of heart diseases. As of 8 December 2016, she has raised funds through her charity shows which have helped to save lives of 1333 children suffering from heart ailments. Muchhal has made her entry in both Guinness Book of World Records and Limca Book of World Records for great achievements in social work”. Yet another super talented lady from Indore is Jaymala Shiledar. Born in Indore in 1926, she went on to become an established Indian Hindustani classical singer and theatre actress. She appeared in several sangeet nataks (musical play) and also composed music for some of them. She made her career go for over 50 years, wherein she appeared in more than 4500 shows. She is also a recipient of Padma Shri in 2013.
Who does not know this gorgeous lady of the Indian television industry Ankita Lokhande? Born on 19 December 1984 in Indore, Madhya Pradesh, Ankita was passionate about acting since a young age. Ankita was awarded as Great Face of the Year 2010 by Indian Television Academy Awards for Pavitra Rishta. In addition to this, she has also won Most Popular Television Personality of the Year in Indian Telly Awards 2012 and Best Actress in Drama Series for Pavitra Rishta by Star Guild Awards 2014. Did you know about the fact that as many as 12 women from Madhya Pradesh had made it to the coveted list of 100 women achievers from India which was also known as the ‘#100 Women Initiative’ in the year 2016? It was jointly launched by the Union Ministry of Women and Child Development (MWCD) in collaboration with Facebook. These superwomen were felicitated by the former President Pranab Mukherjee at Rashtrapati Bhavan. 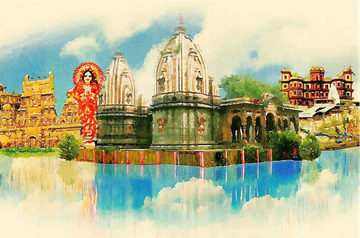 Monica Sharma, Seema Parihar, and Dr. Lalita Anand were the ones who made the city of Indore fill with pride. How many of us love the sweet, innocent and pretty “ Angoori Bhabi” from Bhabiji Ghar Par he? Well, we certainly do! This dynamic actress is Shubhangi Atre and her cute features make it obvious that Indori girls are the cutest! Also, can you believe that Shubhangi, who has earlier worked in shows like Kasautii Zindagii Kay and Kasturi, is a mother of a 12-year-old daughter? “I feel if we have talent, well-maintained personality and a physique for a lead role, we can easily get them”. Indori ladies have not only left their impression in the fields of arts but also excelled in the sports fraternity. Sandhya Agarwal is the name of one of them. Sandhya Agarwal who hails from Indore was also a former captain of the Indian women's cricket team. Sandhya, an all-rounder, has played in 13 Test matches from 1984 to 1995 and has scored 1110 runs at a batting average of 50.45, including 4 centuries. She reached her top score of 190 against England in 1986. At this point, she was beating Betty Snowball's score of 189 that had held the record in women's Test cricket since 1935. Sandhya has made Indore prouder by being a receiver of Arjuna Award for Cricket. These are just a handful of names of the women who have made themselves as an epitome of hard work and perseverance. I am sure there might be tons of Indori ladies who have been doing a remarkable job in their own lives, in their own ways. And hey, I have also heard Indori ladies are very interactive and bubbly! If that's true, do comment in the below section to say a Hi! We would love to talk! You can also head to our Indore community here to meet more take charge Indori women! See you there. Thank you all for your comments and appreciations!! Proud to be from Indore. Awesome....proud to be an Indori. Singh Anamika, sure thing. Which city you want us to cover next? Inspiration from 2015 – here’s to the courageous ones!